Part Reiki, part massage, all wonderful, nurturing, and healing on all levels! Most simply put, Reiki is an alternative healing modality. Most people have heard of "laying on of hands," and Reiki is a form of energy healing that consists of a practitioner "laying hands" on someone - or even just holding his or her hands in that person's energy field - and transmitting a healing energy to that person. 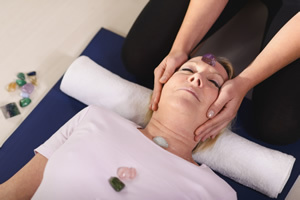 At Healing Hands Massage & Bodywork, we offer a variety of Reiki services - Reiki sessions as well as Reiki-ssages, which are a combination of Reiki and massage. We also have regular Reiki workshops for those who are new to Reiki and wish to learn it, and also more advanced workshops for those who have begun their Reiki training but wish to further their learning. please email Jenni if you have questions! Do you feel that you have a healing gift? Are you interested in learning to heal yourself and / or others? Have you heard of Reiki but would like to learn more? Session 1 will be the basics of Reiki; its history, practices, what the different levels mean, methodology, and the chakra system and how this relates to Reiki. The attunement will give each student the ability to channel Reiki healing energy to him or herself, as well as the student's friends and family. Jenni is a certified Reiki Master / Teacher, with 12 years of Reiki experience and 29 years experience in general energy healing. My classes are small so that I can give very individualized attention, and answer as many questions as possible. A typical class consists of 2-4 students, though there may be as many as 6 (never more than 6) . Please email me if you should have any questions! Sign ups will be taken until one week prior to class date, but if it's closer please email me if you are interested in case there are still any available spaces. Total cost of the 2-evening workshop is $175 per person. Session 1 will include a brief recap of Reiki I, and will also cover three symbols. Students will practice the symbols and practice how to apply them while using Reiki, including the distance symbol which allows the practitioner to send Reiki long distance. It also allows the practitioner to send Reiki to different time periods - in the past and the future! Students will learn various applications of using this symbol, along with a fun exercise. Jenni is a certified Reiki Master / Teacher, with 8 years of Reiki experience and 29 years experience in general energy healing. My classes are small so that I can give very individualized attention, and answer as many questions as possible. A typical class consists of 2-4 students, though there may be as many as 6 (never more than 6) . Spaces are limited, sign up now (minimum 3 people, maximum 5 people for this workshop) with a deposit of $100 paid directly to Jenni (balance due in cash at time of class). OR to pay in full with your credit card, please click here. Jenni is a certified Reiki Master / Teacher, with 8 years of Reiki experience and 29 years experience in general energy healing. Reiki III is generally taught either one on one, along with an assistant for the student to practice attunements with, or sometimes in very small groups of 2-3 students if I have more than one student ready at the same time, who seem like good fits with one another for the class. I will never have more than 3 students in a Reiki III.